In 1853, with help from Emerson, Delia Bacon, an American teacher and writer, travelled to Britain to research her belief that Shakespeare's works were written by a group to communicate the advanced political and philosophical ideas of Francis Bacon (no relation). Later writers such as Ignatius Donnelly portrayed Francis Bacon as the sole author. The American poet Walt Whitman declared himself agnostic on the issue and refrained from endorsing an alternative candidacy. Voicing his skepticism, Whitman remarked, "I go with you fellows when you say no to Shaksper: that's about as far as I have got. As to Bacon, well, we'll see, we'll see." 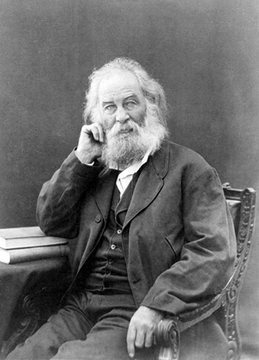 Skeptic Walt Whitman considered the works "feudal"
In 1918, Professor Abel Lefranc, a renowned authority on French and English literature, put forward William Stanley, 6th Earl of Derby as the author, based on biographical evidence found in the plays and poems  In 1920, an English school-teacher, John Thomas Looney, published Shakespeare Identified, proposing a new candidate for the authorship in Edward de Vere, 17th Earl of Oxford. This theory gained many notable advocates, including Sigmund Freud. By the early 20th century, the Bacon movement faded, resulting in increased interest in Stanley and Oxford. In 1923, Archie Webster wrote the first in-depth essay on the candidacy of playwright Christopher Marlowe. In the 1950's and 60's, the "group theory" of Shakespeare authorship was quite popular. It is known that during the late 16th century, collaboration in the writing of plays was not uncommon. For example, John Fletcher appears as the co-author of Henry VIII. Edward de Vere, Francis Bacon, William Stanley, Roger Manners and Mary Sidney Herbert were proposed as members of such a group. Most Group theories of the time included Edward de Vere as a key component, with one such group known as the "Oxford Syndicate". Other playwrights who have been proposed as co-authors include John Lyly, Thomas Nashe, Christopher Marlowe, and Robert Greene. Since the publication of Charlton Ogburn's The Mysterious William Shakespeare: the Myth and the Reality in 1984, the Oxfordian theory, boosted in part by the advocacy of several Supreme Court justices, high-profile theatre professionals, and a limited number of academics, has become the most popular alternative authorship theory.